I had to sell my L5 years ago when money was extremely tight. I miss it. It was the coolest solid state amp I've heard. The Lab Series L5 was built by Norlin using both Gibson and Moog resources. It's the only solid state guitar amp I ever really liked. (B. B. King and Ty Tabor like them, too!) The clean tone is excellent. The built-in distortion is OK, but the amp sounds better with a good distortion pedal, or using a small, overdriven tube amp as an overdrive. The parametric mid on the second channel is very cool (one of the better two knob parametric mid controls made), as is the built-in compressor. The reverb is pretty good except at extreme settings. The multifilter is essentially a six-band EQ with fixed settings, where you control only how much of the signal through it gets mixed back with the main signal, sort of like a flanger's comb filter with the sweep set to zero. The frequency centers are at 1000Hz, 1370Hz, 1900Hz, 2630Hz, 3630Hz and 5000 Hz. This is one of the few solid state amps I've played that was as loud as an equivalently rated tube amp. It still wasn't light, but it was about as light as a real 100 watt, 2x12 combo was going to get. I gigged with it for about a year, after which Alan moved on to another band (for whom I ended up running sound). I sold it the next year at Christmas because we were flat broke. I've missed it ever since. This isn't a channel switching amp. You can use either or both channels, but you can't switch between them unless you use an external A/B or A/B/Y switch. I never cared; the only time I used both channels was when Alan and I both played guitar through the amp at one time. I think we only did that once outside of practice, though. I called Gibson, and they sent me a service pack, with schematic, parts information, and service notes, I think for free. I still; have it, because I couldn't find it when I sold the amp. They're here under Service Docs. I've never seen an owner's manual, though one apparently exists. Manufactured by Norlin, parent company of Gibson and Moog, using the resources of both of those subsidiaries. There were five models of the Lab series guitar amps-- the L3, L5, L7, L9 and L11. (There were also a keyboard amp, the K5 (two, basic channels and 2x12" with 2 tweeters), a bass combo, the L6 (100W, 1x15") and two bass heads, the L2 (single channel, 100W) and L4 head (two channels, 200W).) 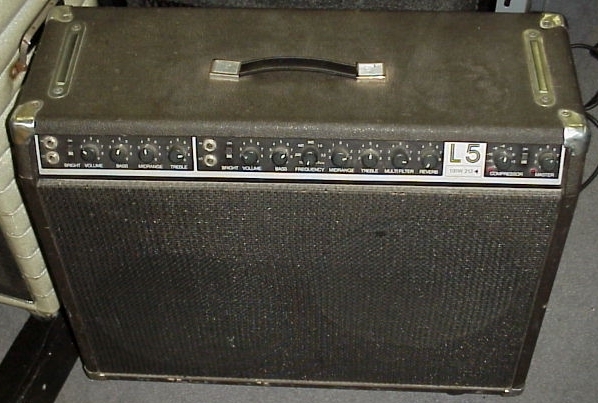 The L3 was a simpler amp, with only basic controls (input, bass, mid, treble, reverb, master volume, bright switch). The only differences in the other guitar amps were the speakers and wattage. listed under "Lab Series L5"
Amp photo from inventory of Broadway Music in Nashvile. Used with their permission. Copyright Y2K++ Miles O'Neal, Austin, TX. All rights reserved.